Captaintreacherous did it again this weekend, winning on Pocono’s five-eighths track in one of three elims for next week’s Max Hempt stakes. The champion glamour boy pacer paid $2.40 but our best pick was in the first “Hempt” elim, where we nailed Emeritus Maximus, which paid $19.20. Our only other winner of the big Pocono program was the obvious I Luv The Nightlife, paying $2.20. We were nowhere near the board in the Ben Franklin elims. 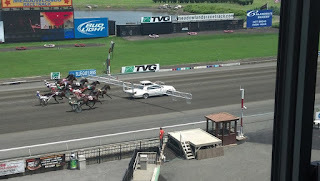 Listeners of North American Harness Update were handed a Pick-4 on June 21 as Ray Cotolo handed them the winning combo at the Meadowlands. The $36 ticket for the Pick 4 in races seven through 10 featured Raring To Go S ($24.20) and Crown Lady ($15) on the high prices. The ticket paid $777.10. For result stories and our winners on soph-colt-and-filly trotters’ stakes, visit the Hambletonian Society’s special archive page for the Hambletonian Trail stories. The following are the horses that finished second or third along with their post-time odds. Special notes on those finishes follow. Daydreamin Lynx finished second to the favorite at 156-1 and the exacta came back $273.00. He paid $38.60 to place. All adjustments for returnees to the list and additions will be in the Thursday blog. The babies were at it again at the Meadowlands. 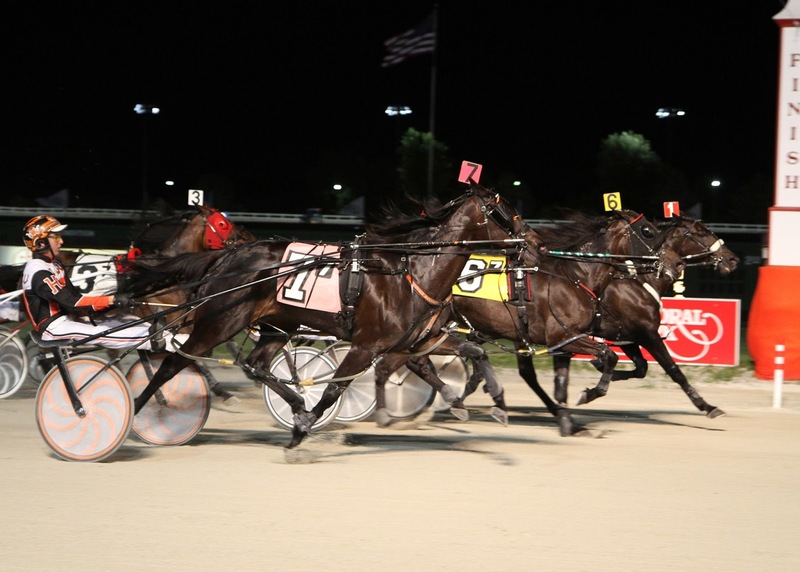 Two-year-olds were readying for the big frosh season and two trotting colts were reportedly quite impressive, each winning in 1:57.1, according to Meadowlands reporter Nick Salvi. Nuncio, from the Jim Oscarsson barn, was away close and then shuffled, rolled by under no urging and won easily. The next was Southwind Spirit’s wire-to-wire win. This Muscle Hill product is from the Ron Burke barn. Derby won for Ray Schnittker in 1:59. He is a son of Hambo-winner Deweycheatumnhowe. The highest priced trotting yearling sold last fall, a Muscle Hill colt named Trixton, won in 1:59.2 from the Takter barn. Shake It Cerry won for the third time in a baby race, this one a romp from start to finish in 1:56.4, also for Team Takter. Pacers featured wins by Avalanche Hanover for trainer Linda Toscano and her filly student, JK Molly won in 1:56. Put On A Display charged home from well back to win in 1:58.3 for trainer Chris Ryder. Ideal Magic zipped to an effortless 1:53.3 win for trainer Tony Alagna and Tellitlikeitis was a 1:53.3 winner for Takter. Stampede Park, the home to horse racing, including great harness racing, in Alberta for many years, was unreachable after the drastic flooding in Calgary. The city was virtually shut down due to the area’s devastating floods. Photos of the facility show the extend of the flooding through this link. There may or may not be a 49th edition of the historic Frank Ryan Memorial at Rideau-Carleton Raceway this summer and will not be a 32nd edition of the Des Smith Classic. The two events, for open trotter and pacers respectively, were the track's signature events but with the dire conditions of racing in Ontario this year, the track feels it cannot present the events. Racing secretary Benoit Frenette said, “We are trying to get a sponsor for the Frank Ryan and I’m ninety percent sure that it will go forward but as an invitation race. I can’t even say what the purse money would be at this stage.” Last year the race went for $183,500. If the Frank Ryan survives, it will be presented on Sunday, Aug. 18. However, the Des Smith Classic has definitely been cancelled for 2013. Last year’s event went for $176,500. 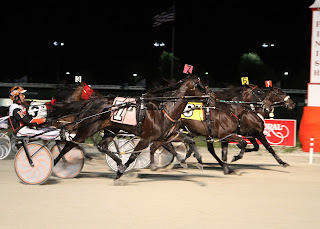 Indulge in many standardbred topics at my Hoof Beats blog titled Vast Performances. Every weekend as part of that blog we offer Balmoral Pick-4-and-win picks at the USTA’s Strategic Wagering Program page which includes suggested win bets. Connect to Twitter and follow Frank and Ray Cotolo for up-to-the-minute suggestions on wagers at many harness raceways. Then, wager from your TwinSpires accounts. Ray Cotolo contributed to this blog.